Sterling, Virginia punk rock band pg.99 is returning for a live performance at this summer's Best Friends Day in Richmond, Virginia. Also known as pageninetynine, the influential group is reuniting after an 8 year absence of activity to perform their seminal album "document #8" in its entirety. 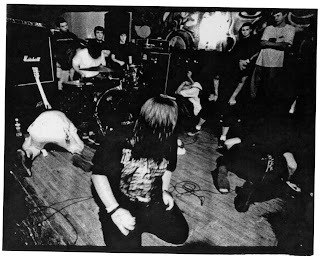 "After a few reunion offers in recent months, it kind of just got us thinking that it would be fun to play those songs again, and if we were ever going to do it again, that now would be the time... We felt Richmond would be great place to do a reunion because of pg.99's early involvement with that area and its punk scene in the late nineties." The Best Friends Day organizers are thrilled to have pageninetynine on the bill celebrating BFD's 10th year as an event, and are announcing them as the first band confirmed for the weekend: "When we initially started planning Best Friends Day 10, we wanted to have a killer band that could share this milestone year with us, and nothing hits home better than one of Virginia's best DIY bands ever," says organizer Curtis Grimstead. "I couldn't be more excited about having pg.99 reunite for Best Friends Day 10." Formed in 1998, pageninetynine steadily gained notoriety as almost a cult of a band, with upwards of 8 people performing at the peak membership. With a menacing sound combining a wide variety of heavy/punk genres, pageninetynine was renown for their powerful and passionate live performances. In their five years of prolific activity they released 14 records and played over 300 live shows, earning them a formidable reputation and widespread dedicated following. Since disbanding in 2003 the many members of pg.99 have gone on to form a slew of bands, including but not limited to Pygmy Lush, Ghastly City Sleep, Tideland, Malady and more. While active, the band released albums with Robotic Empire, Reptilian, Electric Human Project, The Perpetual Motion Macine, Magic Bullet, Witching Hour and many others. I would kill to see this.